The term "dry cleaning" clothes is a misnomer. The process actually involves cleaning clothes in a liquid solvent to remove soil and stains. The process of using chemicals instead of water to clean clothes began with the Romans who used ammonia distilled from urine to clean woolen togas. The process of dry cleaning evolved through the centuries until the 1930s when a chlorinated solvent, perchloroethylene, became the leading cleaning method. The majority of dry cleaners, about 80 percent, still use the solvent perchloroethylene or "perc" today. However, the United States Environmental Protection Agency (EPA) considers perc both a health and environmental hazard. In the 1990s the United States Environmental Protection Agency began to regulate dry cleaning chemicals and encourage commercial cleaners to use safer, more environmentally friendly solvents. This action coined the term "Green Dry Cleaning". 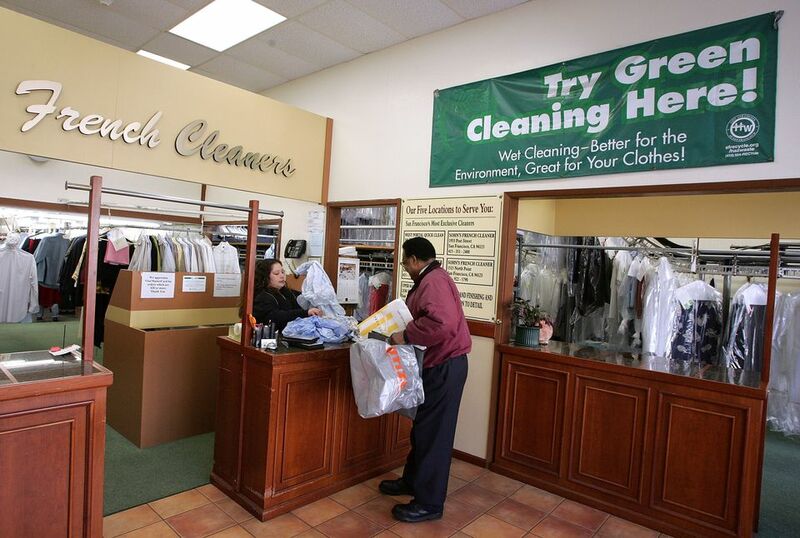 What is Green Dry Cleaning? Green dry cleaning refers to any alternative dry cleaning method that does not involve using perc. One is wet cleaning which is a more gentle version of home laundering. Three other green cleaning methods follow the traditional solvent model but use carbon dioxide, hydrocarbon, or silicon-based cleaners instead of perc. However, of the four types of alternative cleaning offered in the United States, only two are considered truly safe for the environment and consumers. They are wet cleaning and liquid carbon dioxide cleaning. If you are looking for the most environmentally sound cleaning, ask your dry cleaner which of the methods is used in their cleaning process. Wet cleaning uses water and specialized detergents that are milder than home laundry products to clean clothes. Wet cleaners have computerized washers and dryers and professional pressing, steaming, and finishing equipment to make your clothes look their best. The EPA considers it one of the safest professional cleaning methods because there is "no hazardous chemical use, no hazardous waste generation, no air pollution, and reduced potential for water and soil contamination." Extra care is taken before and after cleaning to treat stains since no solvent is used. Carbon dioxide (CO2) cleaning uses liquid CO2 as the cleaning solvent along with detergent. The liquid CO2 is formed by placing the nonflammable and nontoxic gas under high pressure. Liquid CO2 is non-toxic and is actually used to provide carbonation to soft drinks. Clothes are placed in what appears to be a traditional dry cleaning machine and the ambient air is sucked out. The cleaning drum is then injected with carbon dioxide in both gas and liquid form. After the clothes are cleaned, the liquid CO2 is pumped back into a holding tank for reuse. The process is, perhaps, the most environmentally friendly because the CO2 is captured as a by-product of an existing industrial processes. Since less than three percent of the CO2 used is lost into the air with each load of clothing, its impact on global warming is minimal. The process uses less energy than traditional dry cleaning because there is no solvent to heat. While CO2 is naturally occurring and inexpensive, the dry cleaning machines costs around $40,000 each making them cost prohibitive for many small businesses. Some cleaners promote themselves as green by using an "organic" solvent called DF-2000. This solvent is a hydrocarbon that must be made from petroleum. Production of these chemicals raises environmental concerns over greenhouse gases in particular. Some cleaners use the GreenEarth cleaning method to replace perc. GreenEarth is basically liquified sand (SiO2). It functions as a silicone-based solvent called siloxane or D-5. Siloxane is similar to some of the base ingredients used in shaving creams and deodorant. When GreenEarth is discarded, it breaks down into sand, water, and carbon dioxide. The good news is that no chemicals touch your clothes. However, the manufacture of siloxane uses chlorine, which releases carcinogenic dioxin during the manufacturing process. The state of California is leading the way toward green dry cleaning by committing to phase out the use of perc by 2023. The state offers grant money to cleaners that switch from perc to CO2 or wet cleaning. Other states are considering similar legislation. Search for dry cleaners in your area that use the wet cleaning and carbon dioxide cleaning methods. Do You Know What Really Happens at the Dry Cleaner? Dry Cleaning Fluid: What Is It, Where to Use It, and Where to Find It? Is It Ok to Leave My Dry Cleaning in the Plastic Bag?